Since two years ago, I have been involved in PPPLab‘s study on scaling, for which we tried to unpack the concept and make it more understandable and actionable. Next to the publications Explorations 4 and Insight Series 6, we recently developed a tool called the Scaling Scan as we were looking for ways to help projects in the most practical way with scaling. The Scaling Scan consists of a self-assessment that helps projects to identify the key bottlenecks for their scaling strategy. The assessment is based on the ten scaling ingredients shown below, as a central focus to open up a rich understanding of what scaling a solution may require. While we did our best to translate relevant scaling literature into a practical tool that fits reality, in the end it is the intended user who needs to find the tool relevant and useful in their efforts to scale. Lucky enough, the HortIMPACT project of SNV Netherlands Development Organisation indicated that they could use our support in scaling up their business cases. 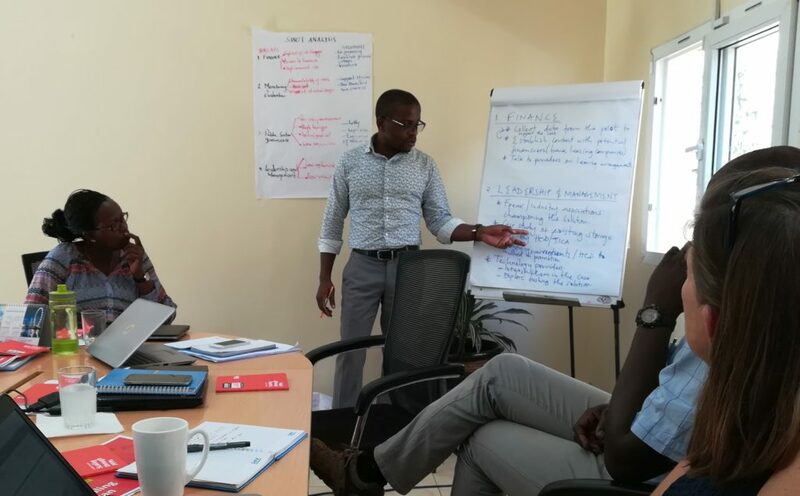 As a result, I recently facilitated a two-day workshop in Nairobi on the Scaling Scan. The objective of the HortIMPACT project is to build 15 inclusive business cases that contribute to positive change and address systemic challenges in the horticulture sector in Kenya. Together with the project team, we decided to apply the Scaling Scan to two of their business cases (one just starting and one finalising), and see to what extent the tool could also be useful for the wider project in future. Access to finance, weak value chain linkages, insufficient public sector engagement and lack of strategic collaboration between key stakeholders were a few of the weaknesses that were identified during the two day workshop, and that need to be addressed in order to really reach scale. At the end of each day, short brainstorm sessions on potential solutions led to clear follow-up actions for the team. They indicated that the tool had really helped them in using a comprehensive perspective on what it takes to scale: it is not just about scaling a specific technology through a business case, but also about looking at many other dimensions such as engaging the public sector, working with sector platforms and building evidence to draw other stakeholders in. The workshop also led to identifying strategic priorities for the project overall. While good work had been done on building strong business cases with the lead partners, the focus on addressing more systemic challenges for smallholder farmers in the Kenyan horticulture sector had moved a bit to the background. The final brainstorm of the workshop therefore evolved around the question how we can use the successes of the business cases to address systemic challenges, and in doing so contribute to positive sector change that lasts beyond the project period. My key take away from this workshop (and an earlier finding of PPPLab research) is that development projects, pressured by their donors to reach large numbers within short project periods, sometimes lose focus on the bigger systemic changes that they want to achieve. This is a pity, and I believe that a broad discussion among key development stakeholders including donors is necessary. In a more practical way, this means that we as PPPLab need to build more emphasis on system change in the tool to facilitate such discussions among project teams. In this sense, the workshop has provided PPPLab valuable feedback and ideas for improvement. HortIMPACT will systematize its experience in the practical application of the Scaling Scan on more business cases and use it for monitoring. PPPLab will keep working on improving the tool; a new version is expected in June. Interested to learn more about the Scaling Scan, or do you have ideas on how to further improve? Please do not hesitate to contact us!